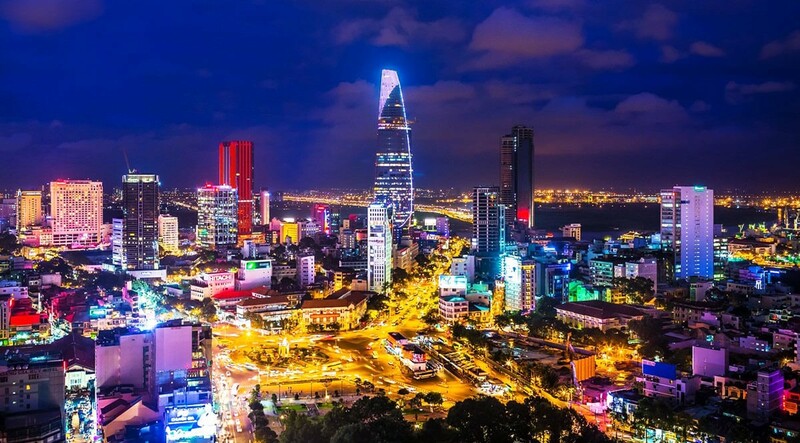 Upon arrival at HCMC Airport, obtain your Vietnam visa (with pre-approval letter), and then clear Immigration and Customs. 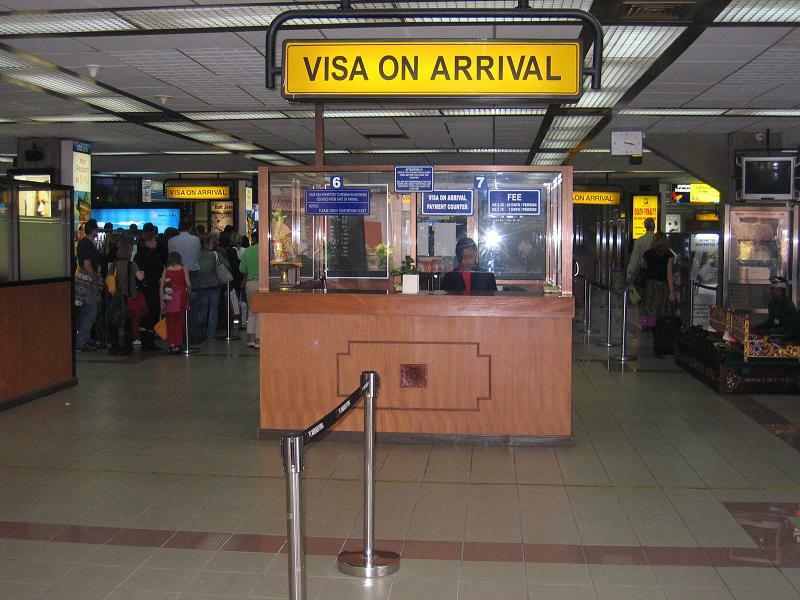 After collecting your baggage, exit the airport to meet outside a local Guide of Asianway Travel. He/she will be holding a sign with your names on it. Please note that local guides are not allowed inside the airport. 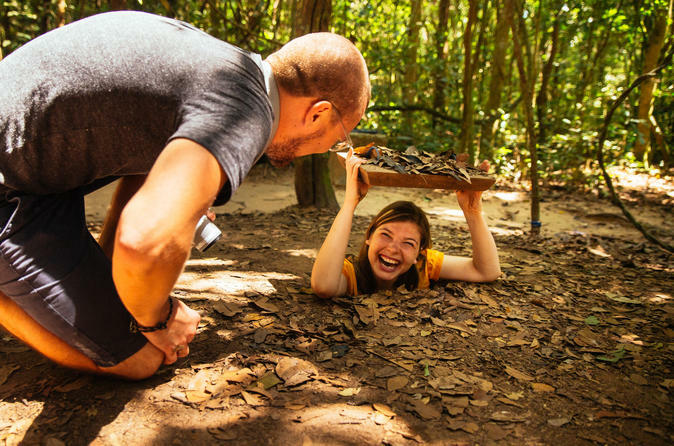 Morning tour of the Cu Chi Tunnels: At 7.00, pick up at hotel & enjoy scenic drive through the countryside as people work on their rice paddies and thatched hut villages scattered along the way. Visit a local village making rice paper, a well-known product used to make the delicious spring rolls. Arriving at the Cu Chi Tunnels to explore part of the 151-mile underground network that zigzagged from the southern tip of the Ho Chi Minh Trail near Cambodia to the Saigon River. Cu Chi is a must for anyone interested in understanding a vital aspect of guerrilla warfare fought by the Vietnamese against both the French and the Americans. These criss-crossing tunnels were begun in the late 1940s by local resistance fighters looking for a place to hide their weapons from the French. Discover secret trapdoors, field hospitals, command posts, underground kitchens, living areas and meeting rooms. Afternoon tour of Ho Chi Minh City: we’ll discover Saigon's historic landmarks including the Independence Palace. Also known as Reunification Palace, the building was used to be the home and workplace of the President of South Vietnam during the American War. It was the site of ending the War during the Fall of Saigon on April 30, 1975, when a Vietnamese Army tank crashed through its gates. Next visit the FITO Museum, it is the first museum of Vietnamese medicine. On display are nearly 3,000 items dating back to the Stone Age. Exhibits include tools used to prepare medicine, knives, mortars and pestles, documents and objects from a traditional pharmacy. The museum regularly screens a documentary about the history of medicine. Continue visiting to the 1880's General Post Office and the late 19th century Notre Dame cathedral, located in a peaceful part of the city. 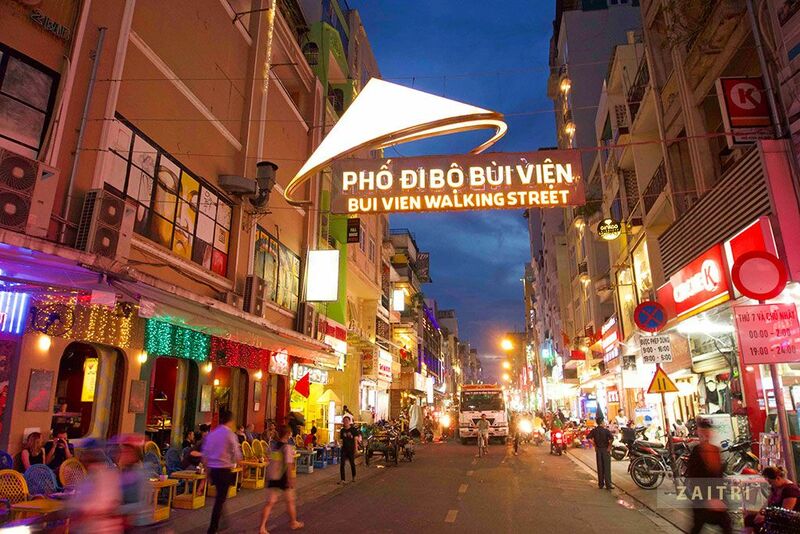 Transferring from the centre of Ho Chi Minh City at 7.00, you will reach Cai Be at 9.30 AM. 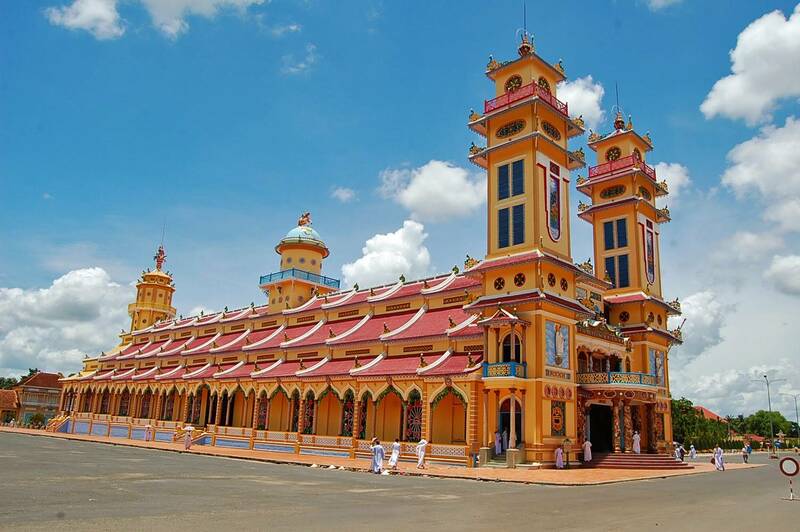 Arrive at Cai Be, you will take visiting to Cao Dai Temple in Cai Be which is symbolizing for the local unique religion and then the Cai Be Cathedral. 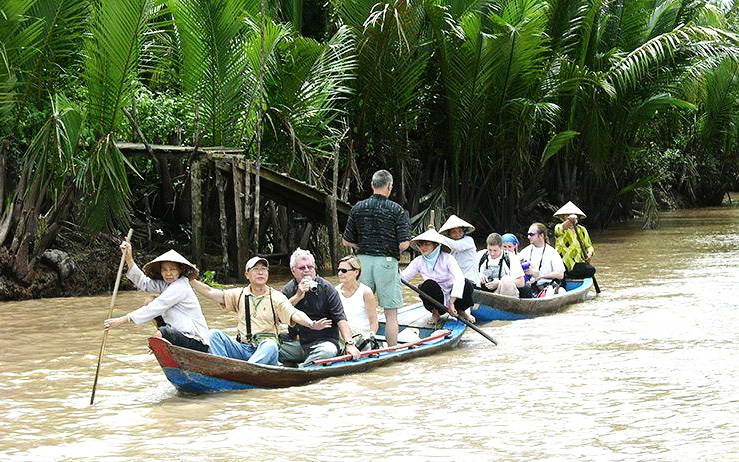 After that, you will embark on the boat to visit the inland and floating markets of Cai Be to observe the daily life of local people as well as to know how the two markets different from each other. You will buy fresh tropical fruits right at locals’ own boats and have chance to talk to them for exploring more their own culture value along with their daily life. Back to the main tourist boat and transfer to our hosted family (located on Tan Phong Island). 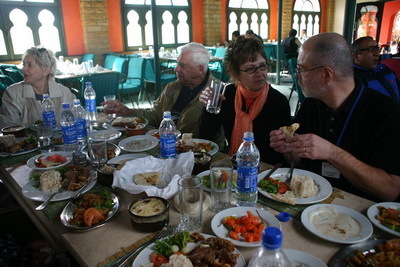 Take a short rest, have a drink and taste the local fresh fruits. Next, we will cycle around to visit Tan Phong Island. If it is on schooldays, you will also have a chance to make friends with local cute and gentle pupils in a village school. Stop at a local farmer’s house to savour a cup of tea and local specialties of banana candies. You can try plucking the fruits at the host’s garden and talk to him to understand how local farmers take care for their gardens. Saying goodbye to the hospitable host, we keep on biking to the bang conical hat (nón bàng) workshop if they open. You will cycle back to the family for lunch with local food and break before embarking on boat to leave Tan Phong Island for the pier to come back Ho Chi Minh City at 17:30. 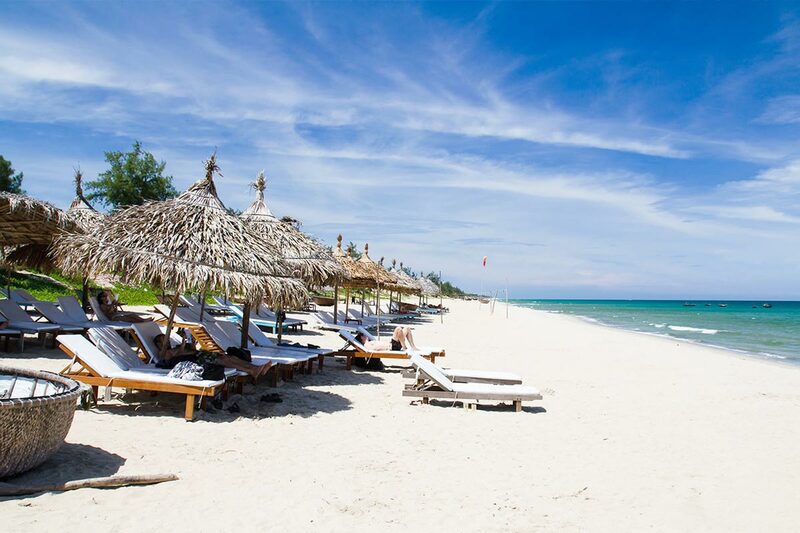 At 11:00 am, you'll be picked up at hotel & private transferred to the airport in time for your flight to Phu Quoc. Fly HCMC to Phu Quoc on Vietnam Airlines VN1821, departing 13:00, arriving 13:55. Welcome to Phu Quoc. Upon arrival at Phu Quoc Airport. After collecting your baggage, exit the airport to meet outside your driver. He will be holding a sign with your names on it. From the airport, you will be privately transferred to your lovely hotel. Settle in and enjoy the rest of day at your leisure. 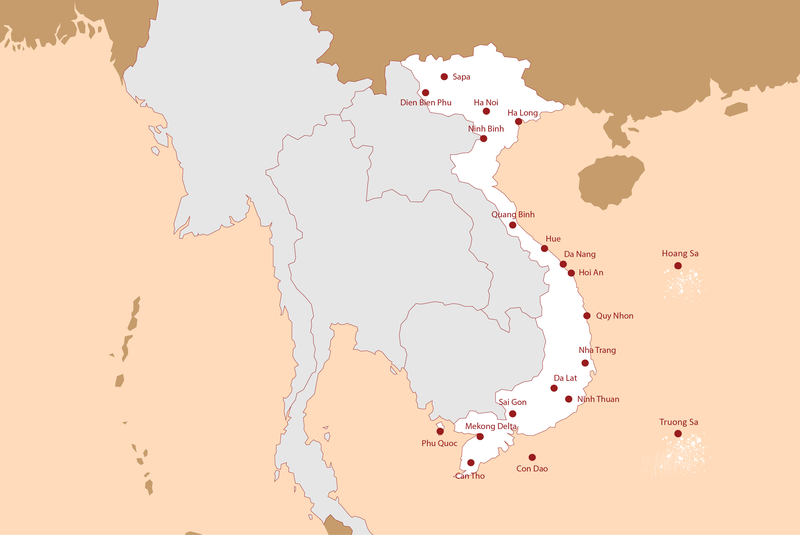 Afternoon: take a flight from Phu Quoc to HCMC then connect to the flight to Da Nang. Up on arrival in Da Nang, you will be picked up and transferred to your hotel on Cua Dai Beach. Check in your hotel and relax. Hotel pick-up at 6.00am and transfer to the Phuoc Hai Fishing Village. Welcome and tour introduction briefing. Guided bicycle tour of Phuoc Hai Fishing Village inspecting the daily life of local fisherman and their families. Travel by ferry to the nearby fish market of Duy Hai Village to inspect the local fishing fleet returning with their catch of fish, crabs, squid, and shrimp. Purchase fresh seafood for lunch. Visit a local fish sauce (Nuoc Mam) producer. Enjoy morning refreshment at a local café. Return to Phuoc Hai Fishing Village by boat to meet and join-in fishing with the local fishermen using traditional fishing nets. 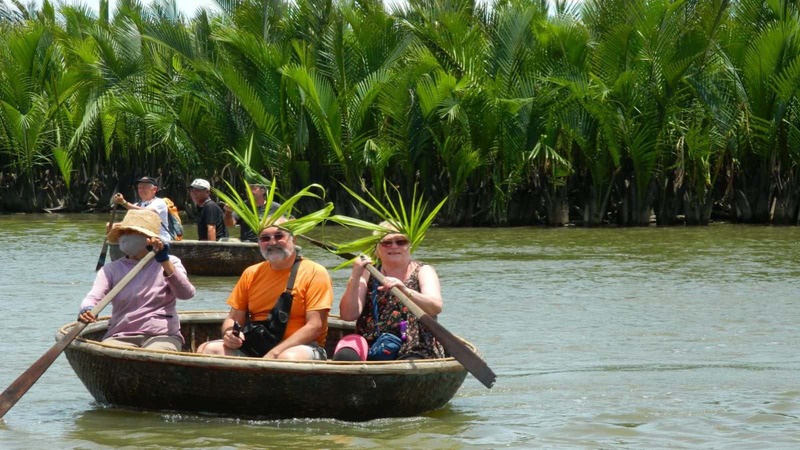 Have fun paddling the peculiar Vietnamese round bamboo basket boat. Learn the Thung Chai whistle while exploring the fresh water coconut forest. Travel to the Cam Thanh rice farmlands. Learn how rice is farmed still using the water buffalo for plough together with the traditional manual processes of raking, transplanting, sowing, grinding and pounding. You have free time until departure to Hanoi (you can choose to fly to Hanoi in the morning, afternoon or evening). Arrive in Hanoi, you will be picked up by your private driver and transferred to the hotel in the center. Check in your hotel and relax. This afternoon, drive through Colonial Hanoi, seeing the Opera House and other local sights. Go inside infamous Hoa Lo Prison (“Hanoi Hilton”), where Senator John McCain and Douglas “Pete” Wilson were once imprisoned, and continue to the Temple of Literature, which dates back to 1070 and is dedicated to the cult of Confucius. Take a cyclo ride through the Hanoi’s Old Quarter, a network of narrow alleys and shop houses also known as “The 36 Streets.” This is a wonderful place to watch the local life, and peruse items from fabrics to crafts to exotic medicines. 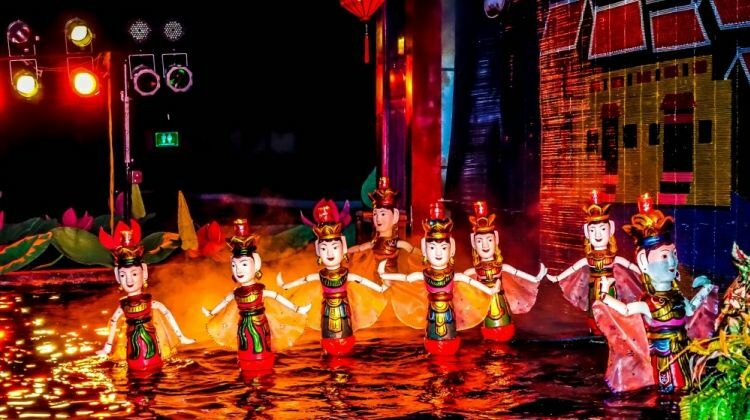 Enjoy a traditional Vietnamese water puppet performance, a uniquely North Vietnamese art form celebrating rural life and folklore for over 1,000 years, this evening. 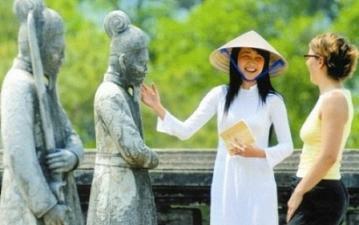 08:00 – 8:30: The cruise’s shutter bus will pick you up from your hotel and heading to northeast of Vietnam. After 4 hours driving, you will arrive at the harbor and take a tender to the cruise. 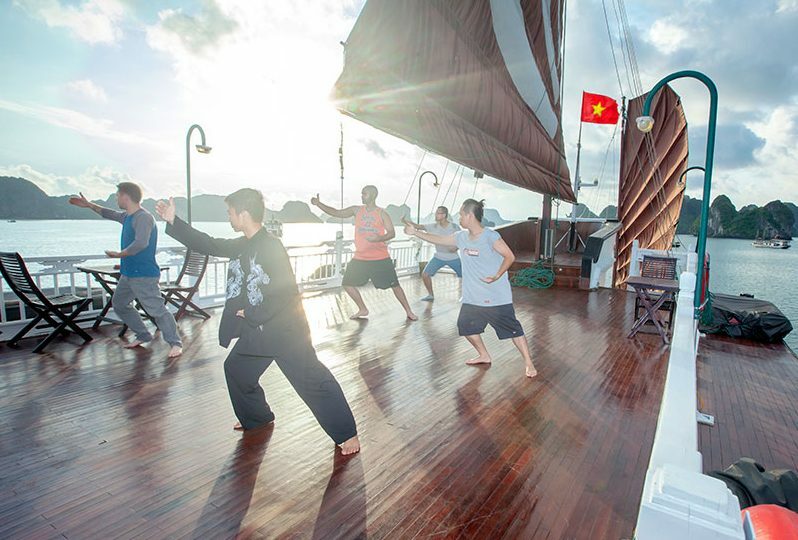 06.30: Starting your day with Tai Chi on the Sundeck. 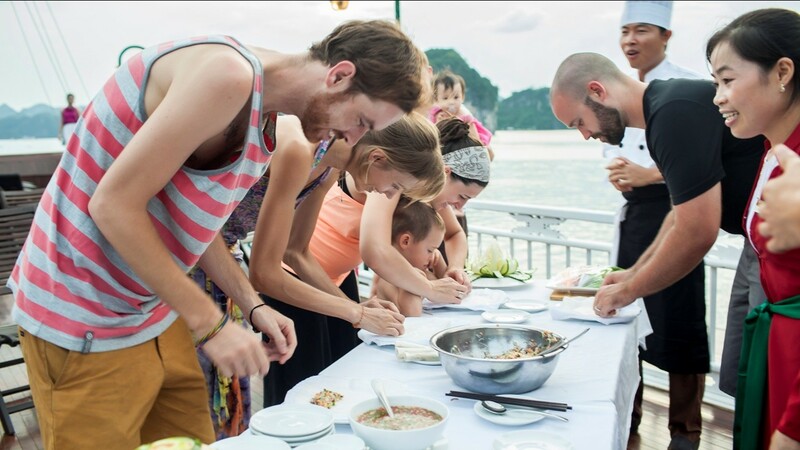 Breakfast will be served in Western style and furthermore with Vietnamese traditional food. 08.30: Explore the well- hidden Thien Canh Son cave… Tour guide will explain the history of Ha Long Bay and this Cave, made by Mother Nature. Then we will move to a Small day boat for go further into Bai Tu Long Bay. We cruise passing several floating hamlets including Cap La and Vung Ha, we enter the centre of pristine Bai Tu Long Geology Park. 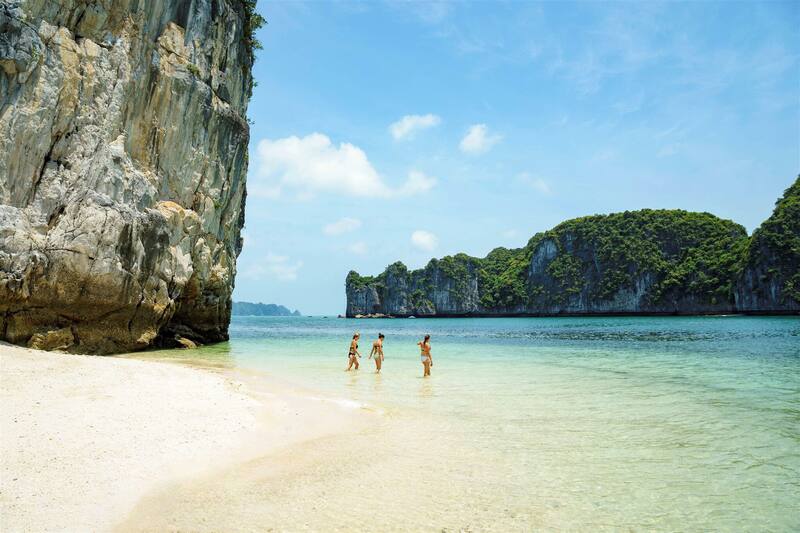 A whole day of fun and relaxation with more kayaking, more swimming, sandy beaches. Tour prices shown are 'per person', based on a travelling party of at least 2 adults, and sharing a room. If you intend to travel alone, the cost might be much higher. However, you also earn money by using the "Find travel mate" button above to invite your friends and family, traveller forum's members to book this tour with you. • 10 nights base in double/twin sharing rooms at centrally located & well selected Comfort hotels (3 star-hotel). • High-end = Best of the best hotels from US$ 250++ per room/ per night.